U.S. stocks ended on a high note Wednesday as investors welcomed comments from President Obama and House Speaker John Boehner on the fiscal cliff negotiations. 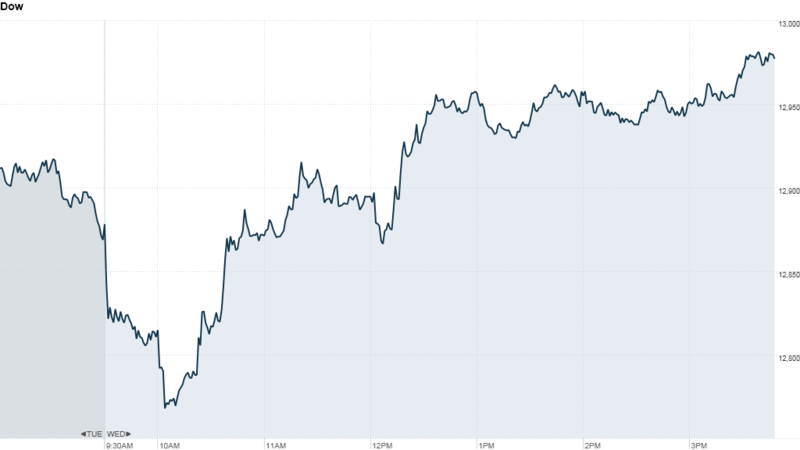 The Dow Jones industrial average gained 107 points, or 0.8%. The index was supported by shares of HP (HPQ), which gained nearly 3%. American Express Co (AXP) and Chevron (CVX) were also strong performers, adding about 2%. The S&P 500 and the Nasdaq both gained 0.8%. Trading has been choppy recently as investors react to political developments in Washington, where lawmakers and the White House have been at loggerheads over a slew of year-end tax increases and spending cuts known as the fiscal cliff. President Obama renewed his call for Congress to pass a bill he says would provide a tax break for middle-class Americans, saying he's "confident" an agreement to avert the crisis will be reached before Christmas. Speaking to reporters earlier in the day, Boehner said he's "optimistic" that a compromise will be reached "sooner rather than later." But he added that it's time for Obama and the Democrats "to get serious about the spending problem that our country has." Senate Majority Leader Harry Reid rattled investors late Tuesday when he reported little progress in the talks. The fear is that failing to resolve the fiscal cliff before the Jan. 1 deadline could shock the economy and send it back into recession. Investors have been paralyzed by this uncertainty and many expect the stocks to remain volatile for the rest of the year. "The fiscal cliff malaise is blanketing the market," said Jack Ablin, chief investment officer at BMO Private Bank. On Wednesday afternoon, a group of CEOs from top U.S. companies will meet with President Obama as part of the "Campaign to Fix the Debt." On the economic front, the government said October new home sales fell 0.3% from the month before, although sales were up 17.2% versus October of last year. The Federal Reserve said economic activity across the central bank's 12 districts expanded at a "measured pace" in recent weeks, according to the latest edition of its Beige Book. The report also said contacts in several Fed districts are concerned about the fiscal cliff. A report in the Wall Street Journal fueled speculation that the Fed could extend its bond-buying program next year to help support the economy. Meanwhile, gold prices fell sharply as the U.S. dollar strengthened against the euro and the British pound. Oil prices were also pressured by the stronger greenback. In the bond market, yields on U.S. Treasuries moved higher as prices declined. In corporate news, big box retailer Costco (COST) announced a special dividend, which will pay shareholders a total of $3 billion on Dec. 18. Shares rose 6%. Costco becomes the latest company to move dividend payments to calendar year 2012 as taxes on payments to shareholders are set to rise on Jan. 1, due to the fiscal cliff. Costco rival Wal-Mart (WMT) is also speeding up those payments. Shares of Knight Capital (KCG) surged 15% after the troubled broker-dealer received a buyout offer from rival and partial owner Getco. The Fresh Market (TFM)stock plunged to a six-month low after the specialty grocer missed earnings expectations and announced that its CFO will step down next month. Fiscal cliff? OMG. Like who cares? American Eagle (AEO) shares were up 7% after the apparel retailer reported strong quarterly results before the market open. After the market closed, rival Aeropostale (ARO) said it earned 31 cents per share in the third quarter, topping analysts' expectations for 29 cents. Shares of troubled retailer JC Penney (JCP), which have been heavily shorted, rose 4.5%. Shares of Green Mountain Coffee Roasters (GMCR) jumped 26% after the K-cup maker issued a better-than-expected outlook for the upcoming fiscal year late Tuesday. European markets closed higher, while Asian markets ended lower on Wednesday. The European Commission approved the restructuring plans of four Spanish banks, clearing the way for long-anticipated bailout of those institutions.